We decided to have my family over for the holidays and discovered that I needed a good selection of beers to serve. I gambled on the Michelob Specialty Sampler Collection from Anheuser-Busch. 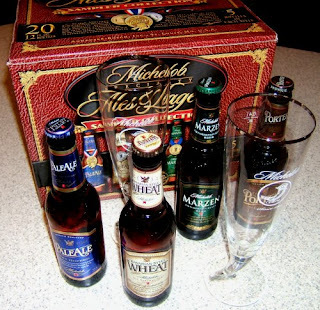 This Sampler Collection is a special 20-pack of four "premium all-malt beers" that essentially constitutes a seasonal variety pack from Michelob. The four beers are their Pale Ale, (Bavarian-style) Wheat, Marzen, and Porter. This is not a commercial or even a glowing recommendation for the sampler, but I thought I mention it in case you're wanting to serve a nice selection to your relatives without breaking the bank. Have you had any of these? What's your opinion.